Paleokastritsa is both the most popular and most attractive resort on Corfu’s west coast. Many regard it as the most beautiful spot on the whole island. One of the first to fall for its charms was Sir Frederick Adam, British High Commissioner to the Ionian Islands in the early 19th century. Its appeal then lay in its steep wooded slopes, blue sea and several lovely bays with bathing beaches. One problem was its comparative inaccessibility, so Sir Frederick had a road built to the village, with the ostensible purpose of erecting a military convalescent home there. The home was never built, but Sir Frederick now found it much easier to take his regular picnics in Paleokastritsa. Such illustrious travellers as the Empress Elizabeth of Austria, Kaiser Wilhelm of Germany and the English writer and artist Edward Lear soon followed in his footsteps. Today there are fewer trees and many more buildings, but the setting has lost none of its beauty. 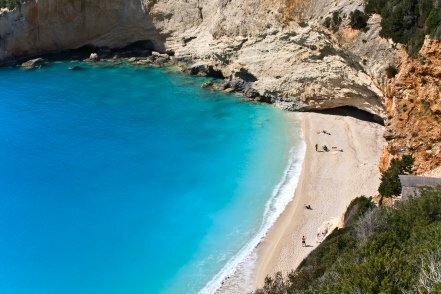 Paleokastritsa is more of a family resort than many on Corfu, as the swimming is safe in any of its three main coves – Agia Triada, Platakia and Alipa – and off other minor beaches around, although the waters here are notably cold. 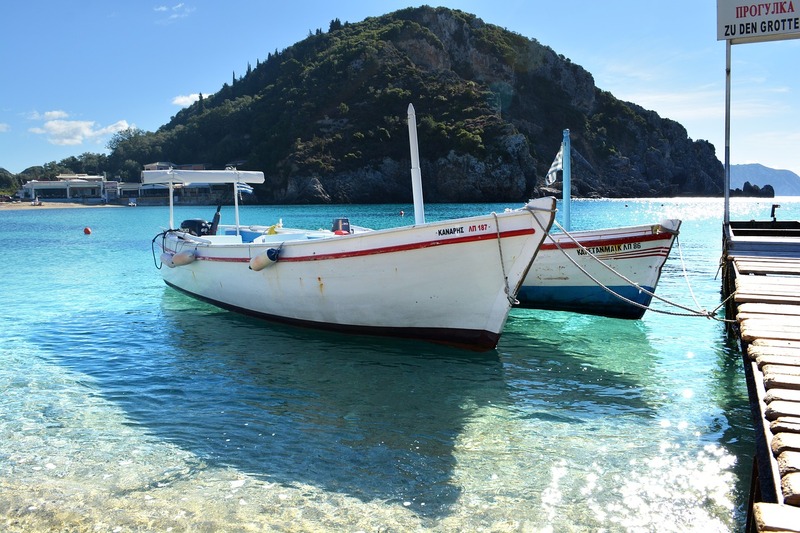 The beaches are a mix of sand, pebble and shingle, most of them served by a taverna and other facilities – boat trips, water-skiing, canoes and a diving school – in summer. From the harbour you can take boat trips along the coast to look at the many grottoes in the vicinity, and out around the Rock of Kolovri, which – like Mouse Island off Kanoni – is said to be the petrified ship of Odysseus. The palace of Alcinous, King of the Phaeacians and father of Nausicaa (who discovered Odysseus after his shipwreck), is reputed to have stood nearby. According to another legend, the Rock of Kolovri is the ship of an Algerian pirate intent on looting the monastery on the headland. As the ship approached the shore, it was turned to stone in answer to the prayers of the Abbot. Today the rock is the haunt of seabirds. The town itself now has plenty of hotels to choose from, plus villas and rooms to rent. Anyone who is not fully fit should note that some streets are very steep. 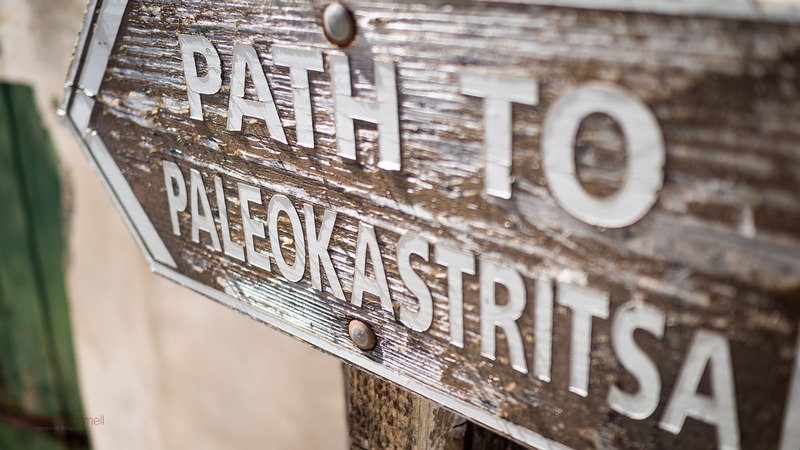 There is no lack of bars and tavernas and, while it does not attract young single holiday-makers, Paleokastritsa’s popularity makes it a place to avoid if your aim is to find peace and quiet. That having been said, there are quieter beaches a short walk away, and the town’s spectacular location does make it a good base for walkers. 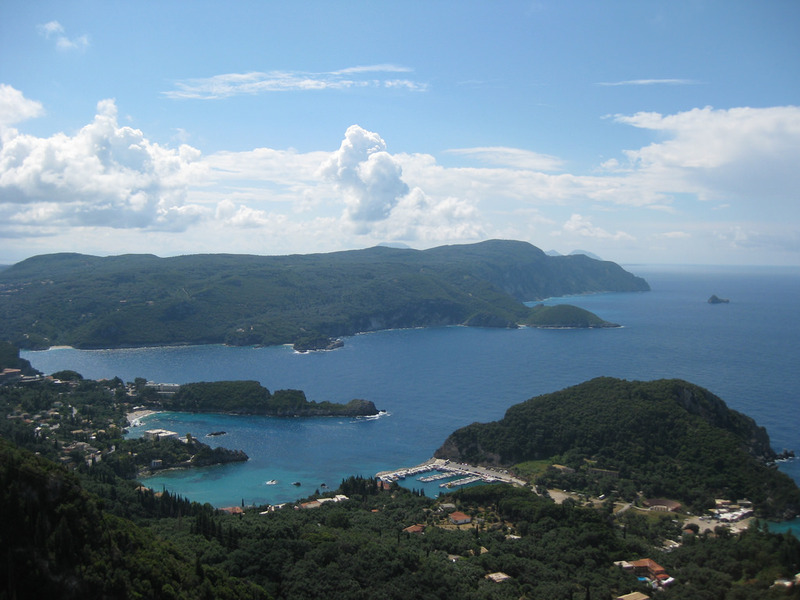 Paleokastritsa is on the west coast of Corfu, and is about 16 miles (26 kms) from Corfu Airport. Because you’re going across the island on some slow roads, the drive should take about 45 minutes.